Kurei wanders into the market place, taking hold of the bag on his side and feeling it from the outside for what little money he has left. "I only feel like I have enough for basic medicine. After all the food I bought I guess I should be fine, just so long as I stick my nose out of trouble." Kurei enters through a small space, filled with crowded people, towards the herbs and vials. Eyeing them out to see what he should take for his future journeys. Annabelle walks towards the herb vendors cart and picks at random herbs while quietly questioning their freshness to herself. "These herbs don't seem to be good enough to make into potions. If i can't find fresh herbs I'll never be able to venture on in my quest." Annabelle pouts but remains hopeful that she'll find some ripe, fresh herbs among the bunch, so she continues looking through the heap. Looking around, Kurei notices someone who is having the same type of problem he is having. Annabelle takes notice of the strange man before her. She gives a genuine smile and looks down shyly at her herbs. "Ohh, umm, I'm actually a little of both." She goes to pick up another herb and clumsily drops the one in her hand. "Oh my, I'm such a klutz!" Annabelle's cheeks turn bright red and she looks down super embarrassed. Kurei looks around and thinks to himself that she's quite a airhead to have such poor hand-eye coordination, but she does have a good eye to note that these herbs aren't that high grade of quality. "Guess there's no help being clumsy unless you train it. Why do you need these herbs anyway? If you're going to sell them, i could use it as I am a adventurer" ~Kurei bows slightly and clenches onto his sword as he says the word adventurer. Annabelle eyes him questionably as she bends down and picks up the herb she dropped, then slowly rises back up. "I'm actually not going to sell them. I'm on a quest, you see. I need fresh herbs so I can make them into potions and medicine. Only the best quality herbs will do." She looks at the herb in her hand and sighs. "None of these are good enough." She throws it back into the vendors cart and looks frustrated for a moment, biting her lip and shaking her head, before looking back at him and returning to her genuinely happy self. "So you're an adventurer huh?" "Yes I am an adventurer, one whose ears pop up on even the slightest Mention of a 'quest'. And on what quest might you be on darling ?" ~Kurei looks at this stranger in the eyes notices her endearing smile turn into a sigh. "My name's Kurei, pleasure to meet you.. . miss. .? Sorry i don't think i've caught your name just yet, have I ?" "Ohh... not many people have ever asked me for my name, but it's Annabelle... Annabelle Hart, and I'm on a quest to help everyone in need. I travel a lot but lately my quest has brought me here to Kiru city. There's been many monster sighting recently. A lot of of brave warriors have been getting hurt fighting these monsters and I can't stand the thought of innocent people getting hurt, so I'm here to help!" Annabelle looks at the stranger warmly and smiles. "I guess you could say that in a way I'm an adventurer too... Mister...Kurei is it?" Kurei looks at Annabelle completely bewildered as she tells him of her duties at Kiru City. "If you don't mind me asking, would you like to join me and form a group. I wouldn't mind having a traveling companion with me. Would you care to join ?" ~Kurei extends his hand in hopes that she would take his and join him in fighting the enemies that border the city. "Simply put, skeletons outside the cities walls'. Annabelle looks at Kurei's hand for a moment as she thinks. Then slowly takes it as she smiles brightly, looking directly into his eyes. "Sure!" she smiles, completely blushing at this point and hoping that Kurei doesn't notice. Kurei makes his way outside the city walls and begins to walk past its gates. Resting his hand over the pommel of his blade for quick reaction on anything that would approach. "Here we are, the wilderness"
"Looks as though it's a quarter past 4 in the afternoon. We might be able to cover a bit more ground before the sun sets and we're forced to make camp." Annabelle follows Kurei outside the city wondering what exactly the future has to hold. The wilderness was a scary place but nothing Annabelle couldn't handle. Somehow it wasn't the wilderness that made her heart pump though, it was Kurei. Even though she had agreed to travel with him, his intentions were unclear to her. Annabelle naturally doesn't trust people but Kurei's genuineness made her decide to give him a chance. She clutches her sword, just in case and ventures on. "Do we have any supplies to make camp with? I'm afraid all I have is a few potions and some leftover Barely soup." "3 Soft bread rolls and a waterskin filled from the cities fountain. I haven't taken one sip yet." Kurei hopped over a small tree trunk and took a whiff of the air around, smelling something awfully foul. "That smell, it's terrible. Smells... dead. We might want to watch our step from here on out. We are in the wilderness afterall, it may be a deer that was hunted and dropped someplace near by." Annabelle covers her nose and continues walking carefully like Kurei had asked, avoiding all the small obstacles and bumps on the path. After a while of walking a cool breeze blows and she drops her hand to cover herself. She shivers. "I hear it gets r-really cold at night, h-here in the wilderness. You wouldn't know how to make a f-fire would you?" "Well i do know how to make a fire but i'm not sure if that would be the best thing to do right about now. I have a bad feeling that we have company. Be ready !" Kurei grips his swords handle and analyzes the area as quickly as he can. He notices that there really are things in these woods, and that foul smell had to be something else. That there's more than one. Annabelle takes out her sword at the sight of the Skeletons. She eyes her target, the skeleton warrior. Standing, its greater than her own height, though its weight easily surrendered to her own, but that was not the concern at the moment. 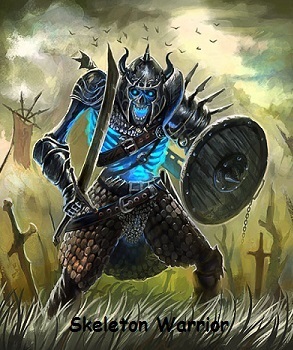 The Skeleton Warrior and the Skeleton Militia, inched closer and closer to her and Kurei, keeping her eyes on them, Annabelle studied their posture, they were slouched over, their bones exposed and goop oozing from them. Annabelle got beside Kurei and prepared for battle. 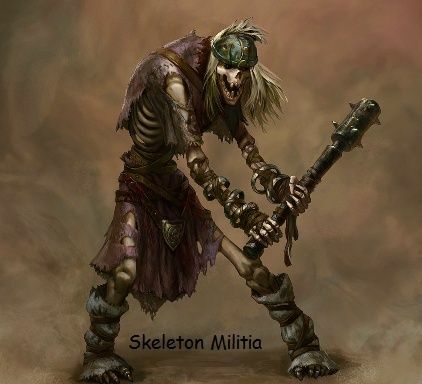 "I'll take the Skeleton Warrior, you take the Militia. Sound good?" "Sure thing, ill try to make it quick so I get time to help you"
~Clenching his blade tightly in his sword hand, Kurei launched himself towards the Militia, hurling past a couple of trees and branches. Leaping over the Skeleton warrior, onto the Militia which was nearby. As the Skeleton before him drew its weapon to attack, Kurei was diving through the air unsheathing his blade and cutting through the arm of his opponent, rolling into the ground and recovering his composure. Annabelle runs towards the Skeleton Warrior, sword in hand firmly grasping it. As the Warrior was focused on turning around to attack Kurei, Annabelle took this to her advantage and sliced her sword through the Skeletons neck, knocking the head off its shoulders. "This is fun huh?!" A wide smile on her face. Dodging deftly, Kurei continued to avoid the skeletons attacks, counterattacking with one of his own movements. Kurei parried a stab the Skeleton attacked with, and rushing forward with his other hand to pull the skeletons arm over his shoulder, and using all his muscle to flip it over and dislocate its arm. Once dislocated he stabbed his skull with sword, pressing it deep into the ground so the monster may forever rest beneath the dirt. "Phew, that worked up a bit of sweat but I think i came out of this perfectly fine. No harm done!" ~ he said smiling widely at Annabelles direction. "You all done? I'm finished with this one." Annabelle lunges her final attacks quickly slicing the Skeleton Warrior into scattered fragments of bones as he implodes. Once that's all taken care of, she wipes the small droplets of sweat off her brow and sighs while chuckling to herself. "Yeah, all done here. Nothing gets your adrenaline pumping like killing a couple of unsuspecting monsters, am I right?" Annabelle puts her sword away and pats Kurei on the back for a job well done. "Now how about we set up camp? I'm starving! Relaxing by a nice warm fire, eating some grub sounds real good right about now." "I'm not sure what these skeleton sighting means but im sure the city is inspecting this issue. Probably have a quest issued tomorrow morning" ~He pulls his sword from the ground and examines it, wondering what might a skeleton leave behind on his blade as he cut through. Suspecting it was clean, he sheathes his blade onto his holster. Annabelle starts eating the bread roll, she tried not to show it but she was quite hungry and that battle had taken more of her energy than she had realized. She took some bites, swallowed, then spoke. "I sure hope these skeletons won't be a big issue. Not everyone can defend themselves like we can. I sure hope everyone will be safe." Annabelle tilted her head down and looked at her bread. She thought for a moment. There was a look of almost sadness on her face, but it quickly disappeared. "Barley soup?" she said smiling, as she pointed to her bag. "I still have some left. All I'd need is to heat it up a bit." Kurei looks over at Annabelle quite bewildered and with a confused look upon his face. "A alchemist that can't start a fire, that's quuite a shock" ~ he said, as he fulled two giant flint stones the size of his hands, and tactfully slammed them against eachother to make sparks fly." This looks good enough!"